Self catering, 4/5 bedrooms, sleeps 12. Walk to pistes/village. Wonderful views. Ski Chalet Etoile is an individual, traditionally styled chalet, with all the modern feature that come with a newly built chalet. Spacious, extremely comfortable, great bathrooms and with an open plan downstairs. Chalet Etoile has been awarded the coverted 5* award from the local tourist office. Located in Chinaillon, the upper ski station of Le Grand Bornand, the chalet is just a few minutes walk from the pistes and the center of the village of Chinaillon with its restaurents and shops. Designed with 2 families in mind, Chalet Etoile is spacious and comfortable. There are 2 double rooms (king size beds) - one en suite, 2 larger rooms which can accommodate up to 4 children or adults, a shower room and 2 separate WCs. The spacious sitting room has under floor heating, a large fire and 3 sofas. A TV room/5th bedroom has a king size sofa bed and en suite bathroom. We have a large open plan well equipped kitchen and in the dining area a large oak table that can seat up to 14. We are James and Harriet and we have three children (Izzy 20, Teddy 17 and George 14). For several years we wanted to own a home in France - when we saw the details for Chalet Etoile we knew we had found our dream. We love Le Chinaillion in all seasons, the skiing in winter, walking and climbing in the November half term, downhill mountain biking and swimming in Lake Annecy in the summer, and generally spending time with friends and family in the stunning surroundings of such a friendly and beautiful village. After our first skiing holiday as a family we realised that The Alps was the place to own a holiday home. We spent about a year looking for the perfect house in the perfect resort. When we got introduced to Le Grand Bornand we realised we had found the place - now for the chalet!! We soon heard a local developer was building a single chalet in a perfect location, and the deal was done. We spent a year creating our dream: A spacious chalet with room for us and my sisters family without feeling on top of each other, great views, a garden, comfy beds, good bathrooms, fluffy towels, well equipped kitchen, toys, videos, books and games - a real home from home (all the things so often missing in a rental house). I think we have achieved it. It is our home and we spend as he much time as possible, and our guests are welcome at all other times. Space, fantastic quality furniture and fittings, fantastic location perfect for up to 12 people. All towels are provided. There is a utility room with separate washing machine and dryer, drying facilities. in the cellar there is a ping pong table and table football. There is a spacious sitting room with comfortable sofas, flat screen TV, surround sound DVD, CD player with i-pod docking station. The well equipped kitchen has a breakfast bar with bar stools as well as a large extendable oak table that can sit up to 14 people. The TV room/5th Bedroom has a king size sofa bed, flat screen TV, with surround sound DVD, CD player with i-pod docking station and benefits from use of an en suite bathroom. There is also an additional WC and am integral garage which is very useful for storage of bags, skis, bikes etc. Chalet Etoile has a full size basement which houses a utility room with washing machine and tumble dryer and a ski and boot room. The location is very good, you can walk to ski bus stop easily at end of drive . Walk 5 mins to bars and Restaurants. We had a really wonderful ski holiday . Harriet was easy to deal with , and Mike (key holder and chalet manager )made the change over easy , and was great with advice and information. Communication was excellent, and all queries were answered without any problem. Very knowledgeable and helpful owners. 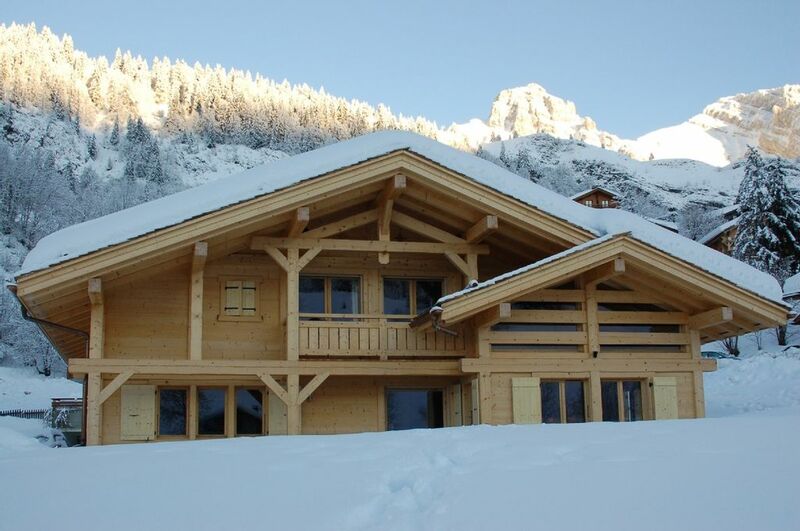 Chalet Etoile is located in Chinaillon, the upper ski station of Le Grand Bornand. Le Grand Bornand is situated in the heart of the Aravis range of mountains just 5 miles from the resort of La Clusaz. The villages of Le Grand Bornand and Chinaillon have been describes as 'one of the best kept secrets of the French Alps' . With over 90 km of downhill ski runs, Le Grand Bornand is clearly not the biggest resort in the French Alps, but it is still a world class resort, with some of the nicest people and shortest queues found in the Alps. It is known for its production of championship skiers and is part of Annecy's bid for the Winter Olympics in 2018. Chinaillon is a very traditional Savoyard village which dates back to the 17th century. Chalet Etoile is located just minutes away from the picturesque old village as well as the main village with its shops and restaurants. The pistes are about a 10 minute walk away or a very short hop on the ski bus that stops at the top of our drive. Please be aware that after large snowfalls it can be difficult to get up and down our drive in a car. The drive is cleared of snow after all snowfalls but we do recommend that if you do not have a four wheel drive car that you have a set of chains (compulsory in the Alps) and ideally winter tyres.